(22.6%) areas have ever tested for HIV. The 2011 national HCT guidelines recommends three models for delivering HCT: Standalone, Integrated Health facility and Mobile/Outreach models respectively. At least 80% of adults access HCT services in an equitable and sustainable manner by 2015. 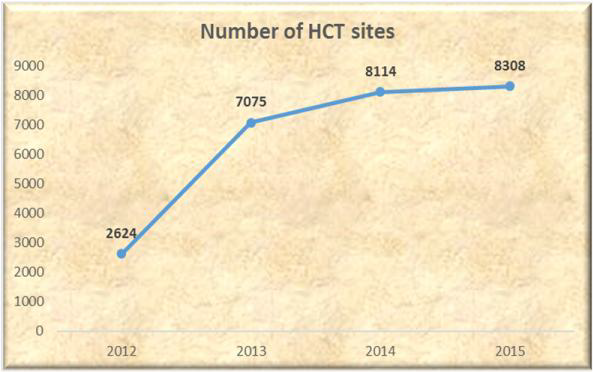 Number of health facilities that provide HCT services has increased almost fourfold since 2012. Collectively the 12 plus one high burden states accounted for 53.9% (4,171,988) of the total number of persons who received HCT in 2015. 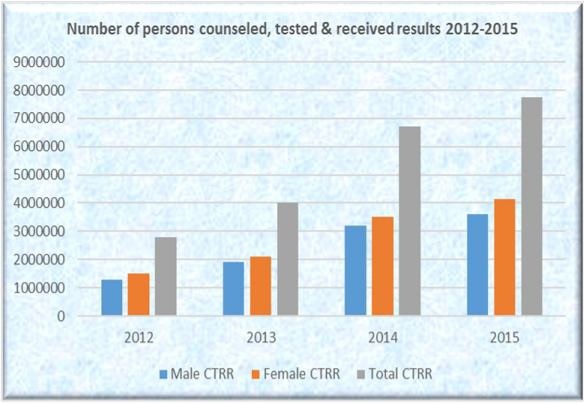 The number of men accessing HCT services has been on the rise even though the number of women accessing HCT is still higher than that of the men. The most recent survey findings show that only 36% in the general population (NARHS, 2012) obtained a HIV test in the last 12 months preceding the survey compared to 86% of BBFSW(IBBSS, 2014). 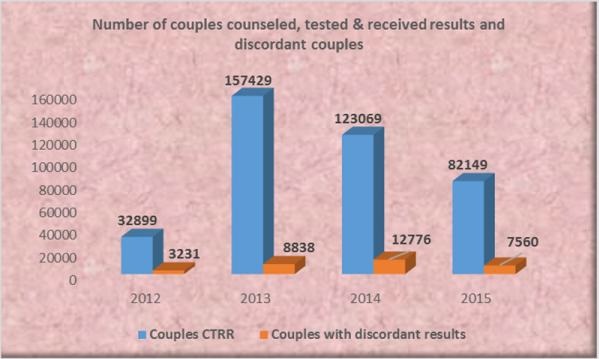 The number of couples who were counselled tested and received results has been on the decrease. However, the proportion of discordant couples dropped from 10% in 2014 to 9% in 2015. HIV counselling and testing is important because it avails more people the opportunity to know their HIV status thus boosting coverage for HIV treatment and care programs as well as PMTCT for eligible persons. The proportion of those who have ever been tested for HIV is highest among key populations perhaps because they perceive themselves at risk of HIV infection unlike the general population who either perceive themselves not at risk or less at risk. Increased awareness and demand creation on the benefits of HCT for the general population is thus needed. Multi disease outreaches that integrate HCT have proved successful in increasing the number of persons reached with HCT in the last two years and should be intensified especially so as to achieve greater coverage for HIV testing among the general population. Establishing, maintaining and strengthening linkages is also vital to ensuring that those who are in need of treatment and care receive the services is very important. Increased number of persons counseled, tested and received results but coverage still low.